Sutherland Trio combines the wealth of experience belonging to three of Australia’s most distinguished musicians. Pianist Caroline Almonte, cellist Molly Kadarauch and violinist Elizabeth Sellars are international prize-winners who have played with chamber ensembles of the highest acclaim. Formed in 2011, the Trio gave its debut concert at Melbourne Recital Centre where it has since performed five subscription series. 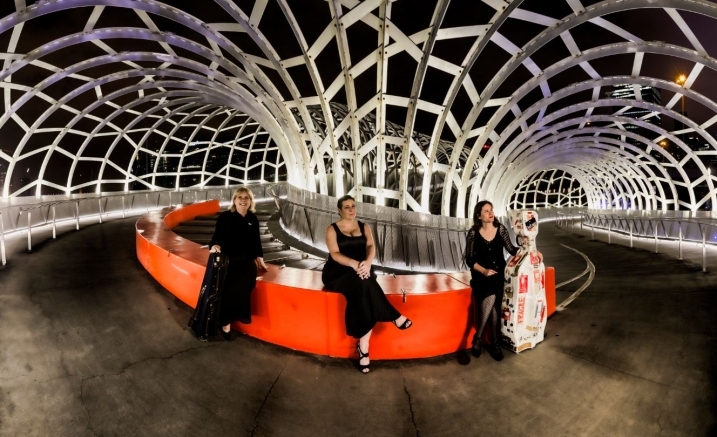 Named after the pioneering Margaret Sutherland who is considered the matriarch of Australian composition, in 2017 Sutherland Trio pays tribute to her legacy by featuring a work by a female composer in each concert. The Trio combines great classics of the chamber repertoire with exciting directions in composition worldwide. Verklärte Nacht (Transfigured Night) is a ravishing and romantic representation of a poem by Richard Dehmel that portrays a couple’s moonlit walk in the forest and explores themes of forgiveness and transformation. Composed in just three weeks, Verklärte Nacht also expresses composer Arnold Schoenberg’s strong feelings of love for Mathilde Von Zemlinsky who he eventually married. Influenced by Brahms and Wagner, Schoenberg’s writing is richly chromatic. As one of Australia’s brightest composers, Katy Abbott Kvasnica further explores transcendence and transformation with her new work written for Sutherland Trio. Kurt Weill’s ‘Tango Habanera’ (Youkali) was written shortly after Weill fled Nazi Germany for Paris. It was originally part of a play about the bordelaise Marie Galante who was kidnapped and transported to Venezuela. Weill’s arrangement of this much loved dance conveys the foreboding shadows and sensuality of Paris in the 1930s. Purchase the Sutherland Trio ticket package and save!